Across the nation, communities have opted to remove Confederate statues that glorify a violently racist past. While those decisions have come with some controversy, it’s nothing compared to the tough call that Fayetteville, NC is currently trying to make. 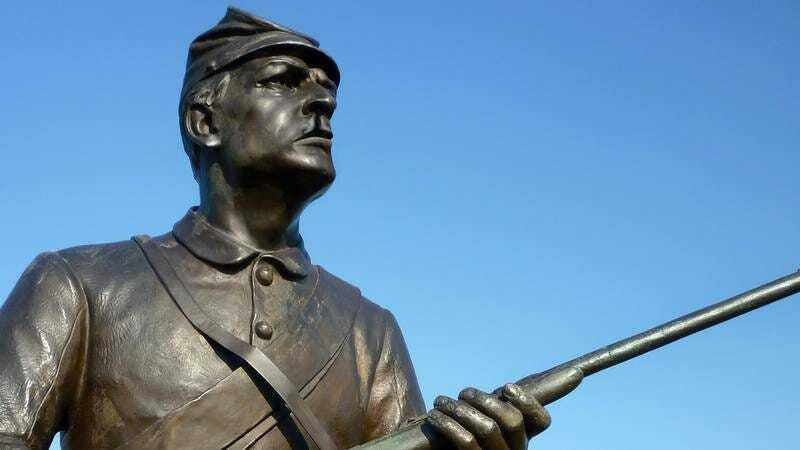 They don’t know whether it’s okay to tear down a statue of a Confederate soldier because the soldier has a cleft palate. Yeesh. Talk about being between a rock and a hard place. On Tuesday, protestors gathered around the Fayetteville statue of the Confederate colonel to advocate for its removal, but they also made sure to chant about sympathizing with the struggle of those with cleft palates. A second group soon arrived and began chanting about how there really aren’t any statues depicting people with cleft palates except this one, and while slavery is reprehensible, it is empowering to represent a community that is so often marginalized. Seriously, this is gonna be a tough one for Fayetteville. Ugh. The Tar Heel state has found itself a real stumper. The city council has gathered multiple times this week to discuss a compromise. The option being considered most seriously is taking down the torso adorned in a Confederate uniform and holding a rifle and just leaving the head with the cleft palate. That way, kids with cleft palates in town can still look up to it without the message that the Confederacy is to be glorified in any way. There is just no win-win for everybody on this one. It’s obvious this town is just trying to do the right thing and that they can agree that the Confederacy was in the wrong, but they really don’t want to send the wrong message to people with cleft palates. This is a real toss-up, and we certainly do not envy the city council of Fayetteville right now. Good luck with this hot potato!